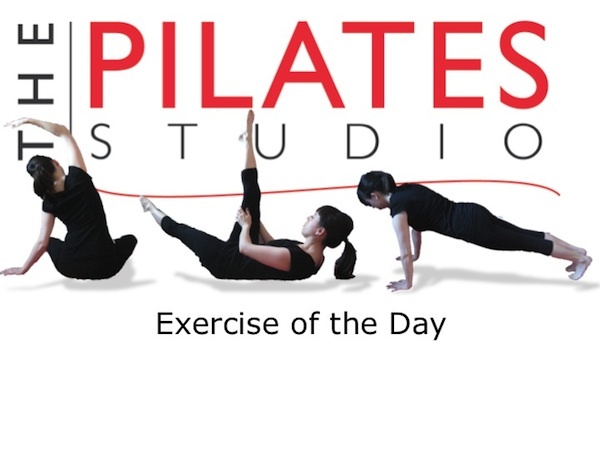 This exercise is a classic Pilates Mat exercise. It is the first exercise in the abdominal series. It requires core strength with hip dissociation. To do this exercise you will need a mat. Start by lying on your back with your knees hugging to your chest. Inhale to prepare and exhale as you press your ribcage into the ground to lift your head, neck, and shoulders into the air. During this exercise you will stretch one leg long while pulling the opposite knee towards your chest and then switch legs. There are many breath patterns that can accompany this movement. I prefer the sniffing breath in which a person inhales for the first two leg switches and then exhales for the next two leg witches. This breath pattern is repeated for ten breath cycles. To release the exercise simply hug both knees to the ground and then release the head, neck, and shoulders to the ground. If you have osteoporosis you can do this exercise, but you should keep your head, neck, and shoulders on the ground. This will give more power to your legs as lever arms so you will need even more abdominal strength to protect the lower back. You can change the breath pattern of this exercise if you would like to slow it down. You may alternate the inhale and exhale for each switch of the legs. And then in the middle of the series you will want to hold your breath for one switch so that you can reverse the breath. It is important to protect your neck as you do this exercise. As you exhale and lift your head, neck, and shoulders, make sure that you are expelling all of the air. This allows the diaphragm to release as high as possible into the lungs, which places the spine in the most advantageous place for flexion.